T-Mobile MVNO PTel is running a pair of promotions that can be combined to give new customers who port their number to PTel three months of service for the price of one. Purchase a PTel SIM or phone and a 2-month activation pack for the $40 or $50 Unlimited Everything Plan from the PTel Website. At checkout enter the code PTBOGOHOLIDAY13 to get a $40 or $50 discount, which makes the 2nd month of the pack free. When you receive your phone or SIM, go to PTel's Activation page, select "I need to port my existing number" and fill out the form with all the required information. For a quick and hassle free port be sure to enter the correct information, especially the Old Account ID and Old Account Password/PIN. You may need to call your old provider to get these. Within a week of your successful port and activation PTel will add a third month of service to your account. The supported carriers for the promotion are all ones that don't use the T-Mobile network. I suspect that T-Mobile subsidizing this promotion to gain more MVNO customers as part of its effort to pass Sprint in total subscriber count. New customers who aren't porting a number or who are porting from an unsupported carrier can still use the PTBOGOHOLIDAY13 code to get two months of service for the price of one. This offer is valid for new activations only, the 2-month activation pack PIN number cannot be used for topping up existing accounts. Note Page Plus is also not on the list and has issues porting to any t-mobile mvno at this time. It's news to me that there's an issue porting from Page Plus to any T-Mobile MVNO. None of Tracfone/America Movil MVNOs are listed. That's the reason Page Plus is missing. so when tmobile advertises how many subscribers they have, that includes subscribers of tmo mvnos? always thought that how it worked. fascinating. In financial reports subscribers are broken out by postpaid, branded prepaid wholesale/MVNO and M2M. The grand total is what analysts and the press typically use for comparison. I finally ported over from Virgin Mobile on the 29th of last December...I used their PTBOGOHOLIDAY13 and got the 1 FREE month through their $54.99 for Sim Card + 2 month , BUT they did NOT give me an additional FREE month...Did they decide NOT to give out that FREE third month? THANKS A WHOLE bunch for this article that gave me the " heads up" on the FREE month/Porting promotion!!! The Free Month For Porting to PTel promotion is still on. 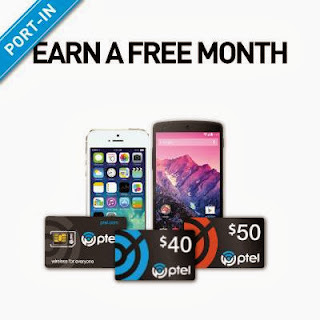 If you don't get your 3rd month within a week of successful porting and activation contact PTel. You can call but using PTel's support form or Facebook page is easier. Hello, I was thinking about this thing: I buy the $50 plan. As soon as they put $50 of bonus in my account I drop the plan to $25 so with $50 I can be 3 months without paying the phone. Is it possible to do? PTel has changed the promotion since this article was written. Now they give you a free month of service when you port a number from a non-T-Mobile based service to PTel, activate it on a $35, $50 or $65 plan and pay for the first month. You can also get a free phone. The free month isn't an account credit that you use to pay for a different plan, it's just a free month.